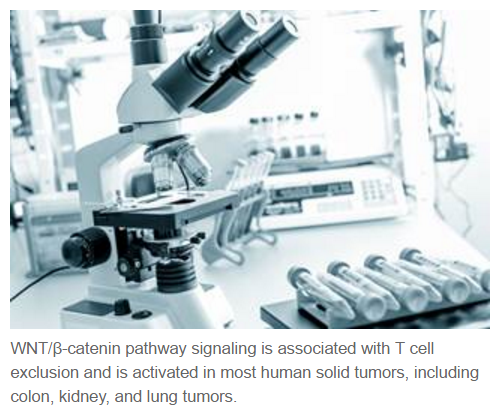 WNT/β-catenin pathway signaling is associated with T cell exclusion and is activated in most human solid tumors, including colon, kidney, and lung tumors. "The T cell-inflamed tumor microenvironment is characterized by expression of immune-inhibitory pathways and predicts patient outcomes to immunotherapy," said lead investigator Jason J. Luke, MD, assistant professor of medicine and medical oncologist at The University of Chicago Medicine. To better understand the molecular mechanisms underpinning the absence of a T cell response in solid tumors, investigators assessed the role of the WNT/β-catenin pathway. "β-catenin represses CCL4, leading to a lack of Batf3+ recruitment, failed T cell priming, and non-response to checkpoint blockade," Dr Luke noted. For the study, researchers collected gene expression data from The Cancer Genome Atlas (TCGA) and segregated the data using a T cell-inflamed gene expression signature to identify patient samples by immune phenotype. They then identified gene expression changes predicted to trigger the β-catenin signaling pathway and performed immunohistochemistry on tumor samples to determine if a correlation between the presence of nuclear β-catenin and the lack of a T cell infiltrate exists. Results showed that predicted activating mutations in CTNNB1 or inactivating mutations in Axin1, Axin2, APC1, and APC2 were observed within 13 tumor histologies ranging in frequency from 9% in esophageal tumors to 67% in colon tumors. Researchers also identified 12 further histologies harboring elevated expression of β-catenin pathway elements, including WNT ligands. Only 3 tumor types, pancreatic, thyroid, and paraganglioma, did not exhibit activation that was associated with absence of immune signatures. Immunohistochemistry further demonstrates an inverse correlation between β-catenin and CD8+ T cells. "Activation of WNT/β-catenin signaling likely contributes to the non-T cell-inflamed phenotype across many cancers," Dr Luke concluded. "β-catenin as a mediator of immune exclusion may represent a rational therapeutic target for combination immunotherapy." Luke JJ, Bao R, Spranger S, et al. Correlation of WNT/β-catenin pathway activation with immune exclusion across most human cancers. J Clin Oncol. 2016; 34 (suppl; abstr 3004).